What if you don’t want the bubbles to pop? Just put on your bubble gloves and bounce the fog-filled bubbles on your hands. It’s two great science experiments in one. Fog-filled Bubbles Bouncing Bubbles = BOO BUBBLES! This experiment flooded our phones with excited fans when Steve introduced it on television and now you can bring home your own Boo Bubble™ Generator! Recommended for children ages 8 and up with adult supervision. *The Boo Bubbles kit does not include dry ice. Contact your local grocery store. We recommend purchasing 5 pounds to experience all of the experiments. 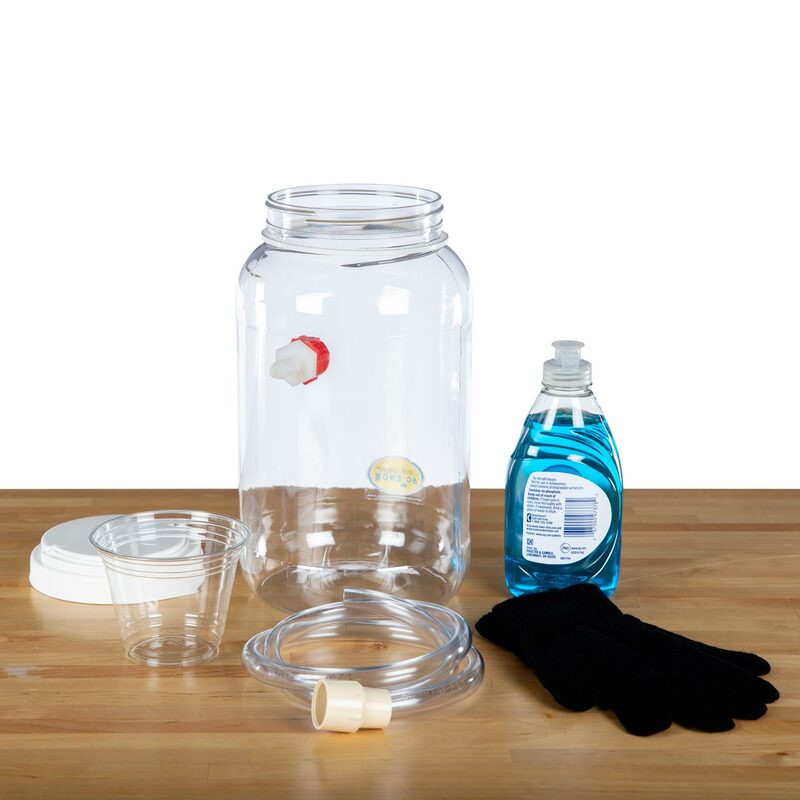 Steve Spangler created the Boo Bubbles kit as an easy and safe way for parents and teachers to explore the science of dry ice. 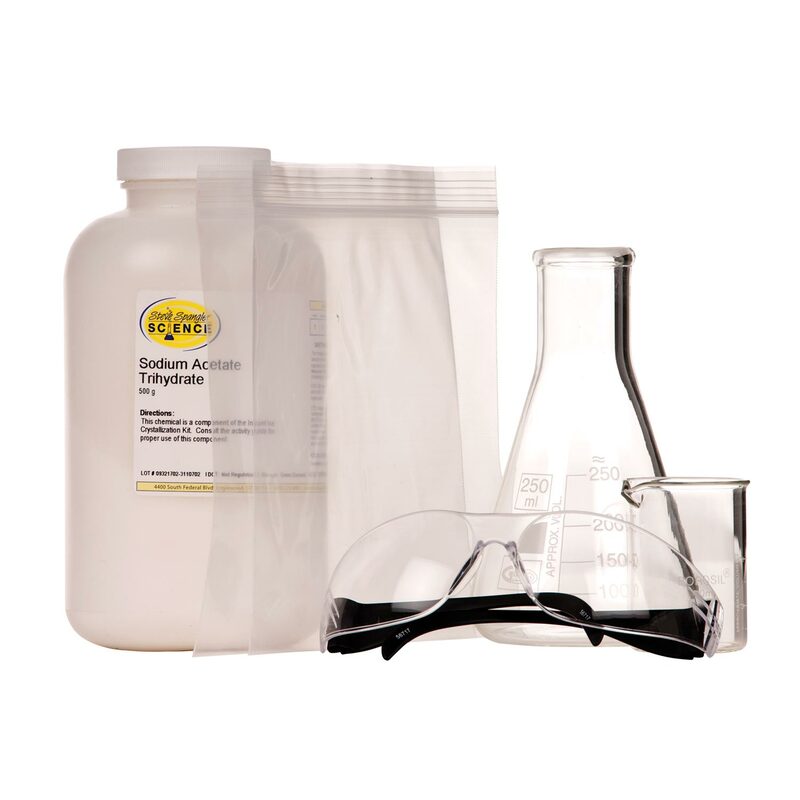 Learn about the science of sublimation as dry ice turns from a solid directly into a gas. Study the rate of reaction as you experiment with different water temperatures. 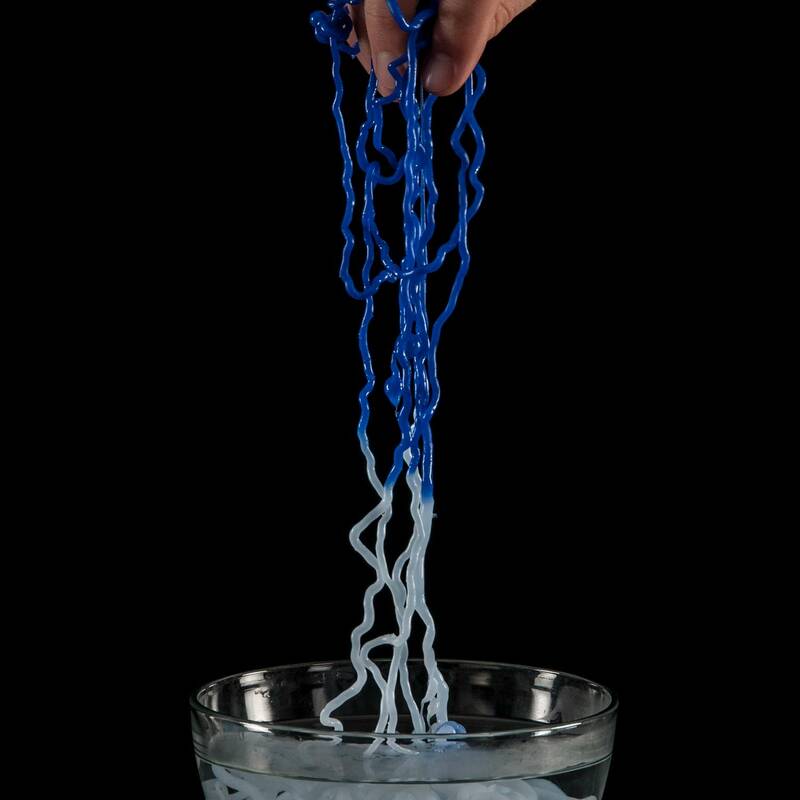 Learn about the factors that turn ordinary bubbles into super bouncing bubbles. How to Safely Handle Dry Ice! Does the kit come with dry ice? No. The dry ice would probably disappear into a gas before you had a chance to use it. Where do I buy dry ice? Inquire at your local grocery store at the customer service desk to see if they carry dry ice. Otherwise, search online for a local dry ice distributor. Watch Steve Spangler’s dry ice safety video for tips on how to travel with and safely store dry ice. The water should only be warm. Using hot or boiling water will only result in a melted, deformed Boo Bubble Generator. How much dry ice should I use? The amount of dry ice you use is up to you. The more you use, the more pressure the hose and nozzle will have. Too much pressure will result in bubbles bursting before you can really experience them. We suggest purchasing 5 pounds of dry ice from your local grocery store to conduct all of the suggested experiments. I used this for my grandson’s fourth grade Halloween party. It was a hit! I did have to change the water out after the 2nd group because the water was cold and the bubbles started to come out slower. But once I put hot tap water in, they started coming out fast again. I did make the bubbles ahead of time and used glycerin. I gave each of the kids a glove to hold and bounce the bubbles with and they had a blast! It was hard for them to not touch it with the ungloved hand, so next time, I’ll have enough gloves for both hands. Lots of fun for my 3 year old (and me)! Who doesn’t need more dry ice in their life? I got this for our Harry Potter themed Halloween party. I dressed like Professor Trelawney and made Boo-Bubble prophecies. Amazing! The kids (ages 4-8) and adults were amazed and astounded. You don’t need gloves to hold the bubbles – just dip your hand in the soapy water first- works great for larger groups. It was so much fun, I have a feeling we will play with this through-out the year, and not just at Halloween. Thanks STEVE! Hello! 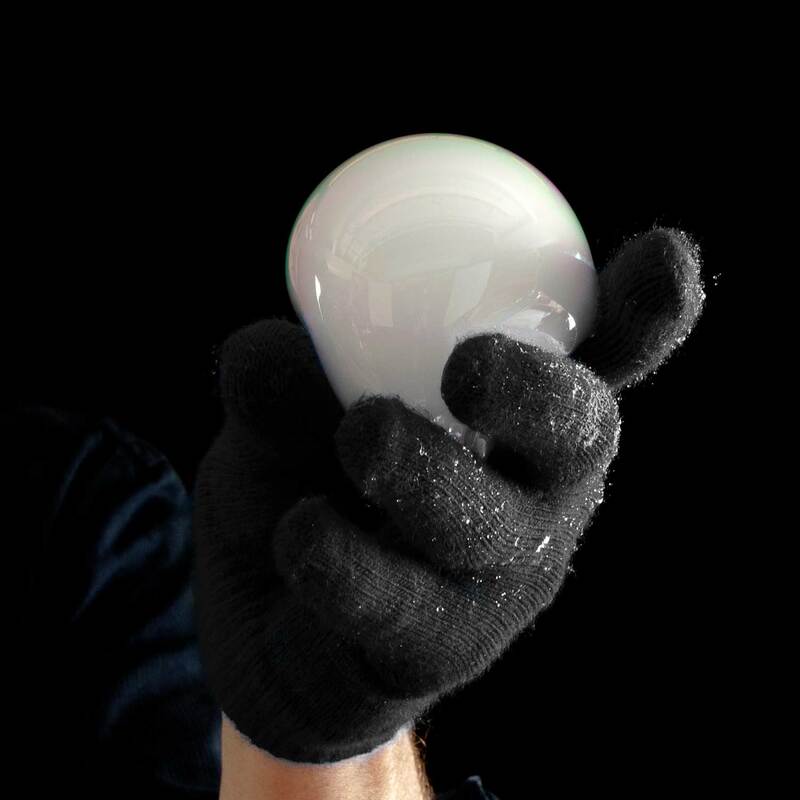 I have been working with Dry Ice for years and have used common household objects to create the bubbles. I like this because it adds variety to a dry ice lesson. I purchased it on my own to enhance my teaching when I saw it as I am always looking for different tools. 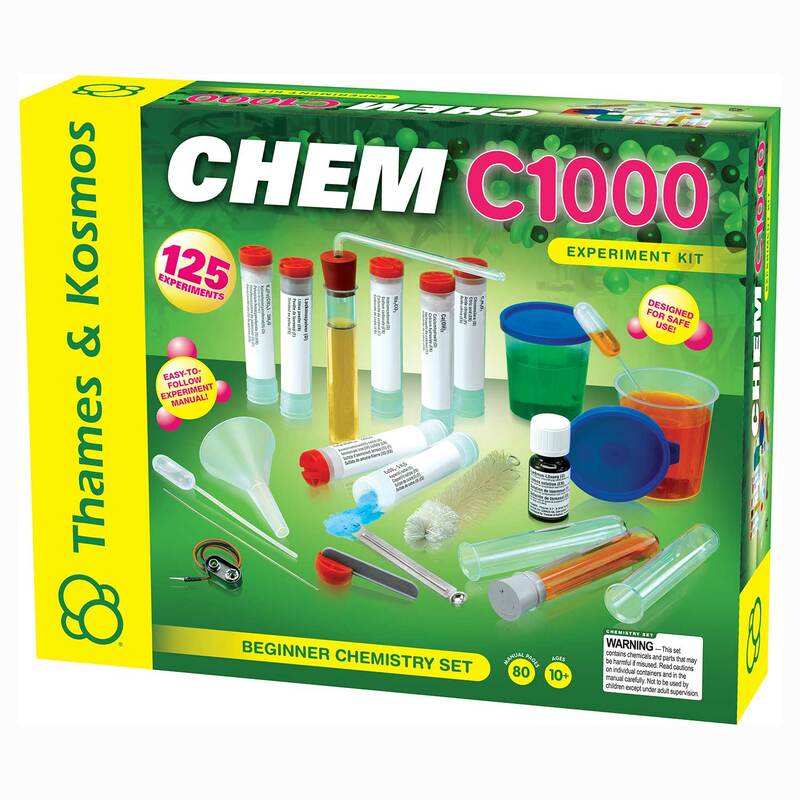 we have used this kit for years and grads, undergrads and younger kids are all wowed by it. We are taking it to DC to use in our booth at the National Science Festival in April. We use this product for one of our party themes. Kids and adults love it! Careful with user error… one of our staff members put boiling water inside to see what would happen and ended up with warped plastic. Other than that, the boo bubble kit is amazing. This kit made the boo bubbles simple. Everything worked as advertised and as demonstrated on-line. Do keep hot water on hand as directed, as the dry ice cools the water very quickly and the bubbles work best with warm water. 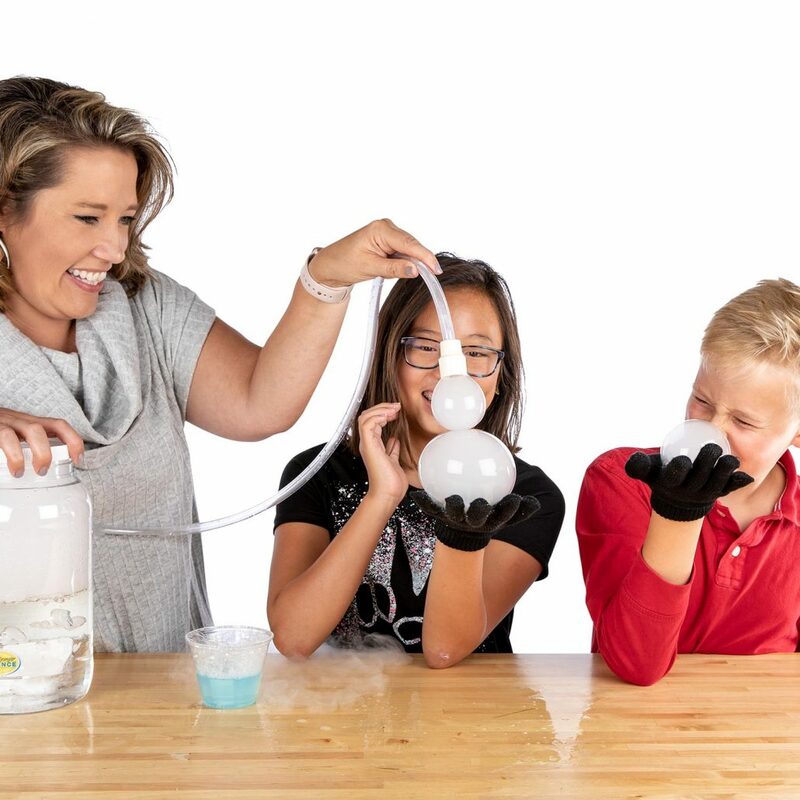 My only addition would be to have more cotton gloves on hand if you have a large group so the students can bounce the boo bubbles back and forth rather than only two hands being able to enjoy that fun at a time. The popping fog is also fun if you stick with only the two cotton gloves provided. Bought these for my nieces Science Party and they were a HIT! Everyone (adults and kids) loved them and couldn’t stop playing with them. Worth the $. 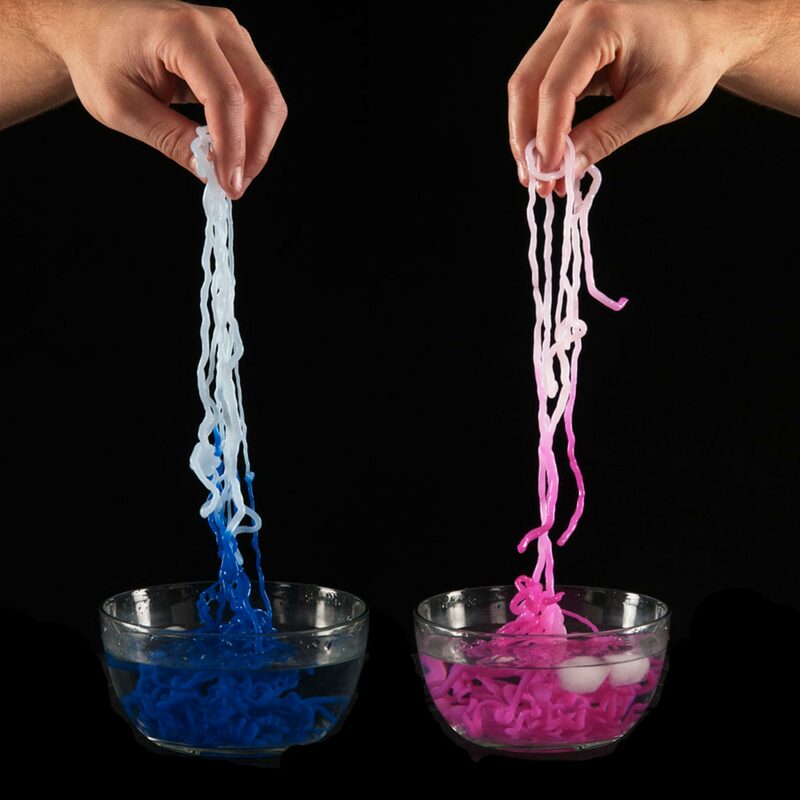 This is a great experiment kit that was a hit with my kids and the neighbors kids. We learned a lot about carbon dioxide and it was great fun. Since I got a lot of dry ice we also did some other experiments that were fun. I plan to use boo bubbles as part of a Halloween party we have each year with our church group. I am confident it will be a big hit. Thanks Steve Spangler Science for helping make Science fun and appealing. I loved the Boo Bubbles! The students were so excited and loved catching the bubbles. One class soaped up their hands and were able to catch them. So if you don’t have the gloves, that works great! I took the boo bubbles to a bonfire we had. The kids needed something to keep there interest other than the other things we had for them. They loved it and we all had a great time with them. We did BOO bubbles as part of our Mad Scientist Mayhem Halloween party theme. What a hit! My sons’ are in 2nd grade and the kids couldn’t get enough of the bubbles. We tried making them big, small, and double bubbles. The kids tried to see how far they could get with the bubbles. I bought extra gloves at Walmart so that everyone could participate at the same time. I highly recommend this project. We had no problems with it. Can I add the atomic glow in the bubble to make it glow? This was such a great question we had to test it out. 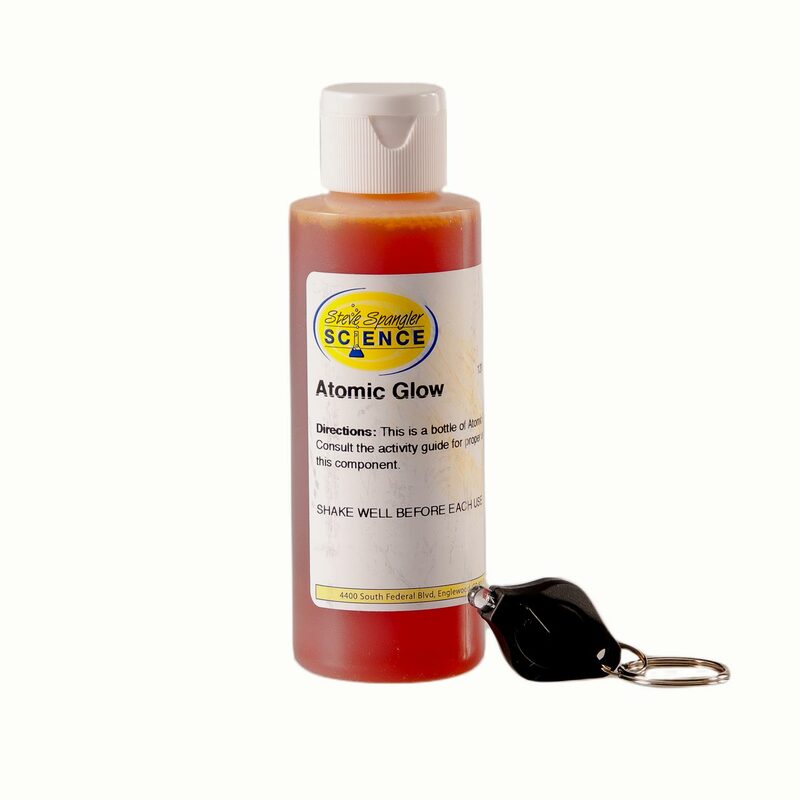 If you add the Atomic Glow to the bubble solution, you will have glowing bubbles, but it is very faint and the longevity of the bubble does not last as long. We did not test it with the Boo Bubble experiment, but we can tell that it will not work well for this experiment. The bubble is much weaker and will not be able to hold the smoke or be bounced around per the instructions. 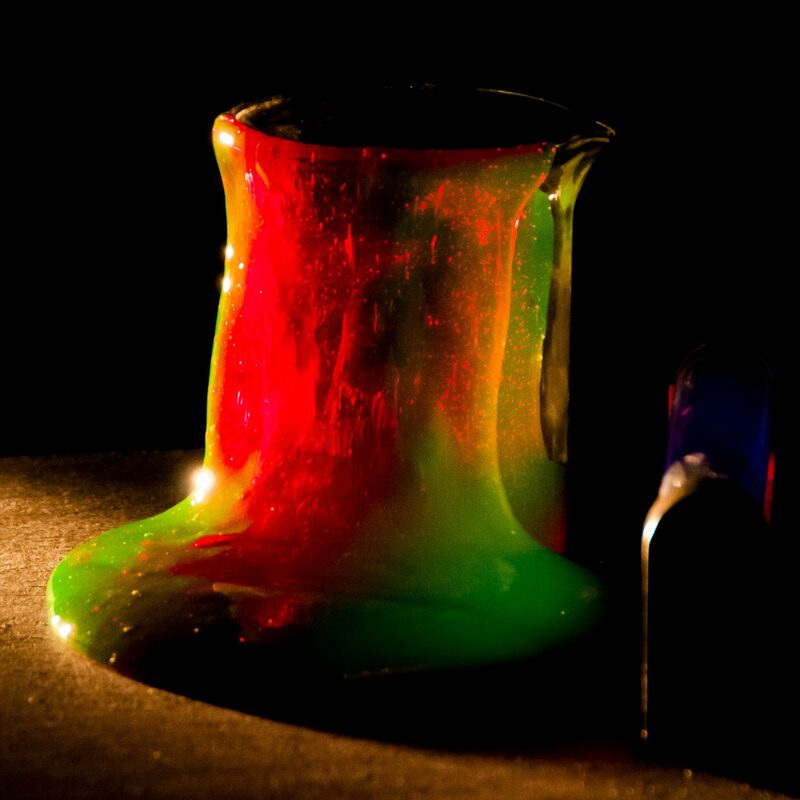 Can add food coloring to make colored boo bubbles? You are welcome to add food coloring to the water. Just be aware that anything you add to the water, may effect the bubble solution and not work as well. We got this for a Halloween party. The kids really enjoyed playing with it for a couple of hours. Not only did they make the bubbles, I also had a container with mostly dishwashing liguid in it and they put the hose in it to make lots of bubbles. It was fun watching the bubbles fill up and flow over the edge of the container. The next day I still had some dry ice left, but my kids weren’t interested in it anymore. I’ll tuck it away for next Halloween and maybe they’ll be excited to use it again. The only problem I had with it was the plastic hose kept coming off and wouldn’t uncurl. If you have a group of kids using it I recommend having plenty of gloves. Once they get wet they don’t work as well. Will dry ice powder work? Dry ice powder and pellets do not quite work as well as blocks of dry ice. You will need a lot more to make it work properly. Easy to and great way to explain Sublimation with a WOW factor. I have used this for three Halloween seasons at an elementary I volunteer with and the kids love the bubbles. I can not make enough of them fast enough. They like trying to make them as well. Good Job Steve Spangler Science peeps! CAN THE BOO BUBBLES BE COUNTED ON THE LOYAL 18 $10 discount? Yes. The LOYAL18 discount is applied to your overall order. what is the diameter of the tube coming out from the jar? 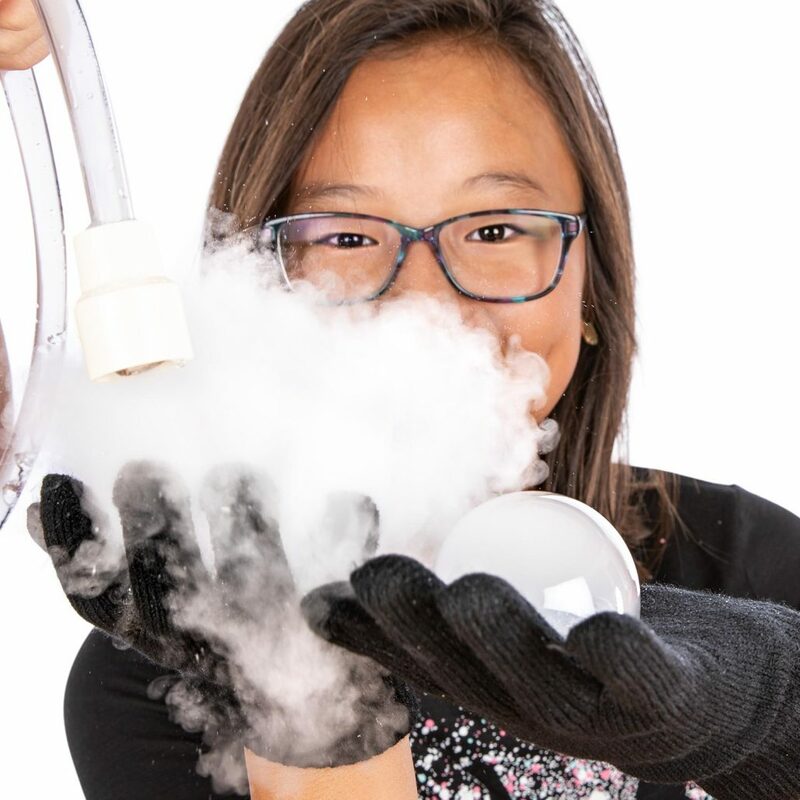 Here is the step-by-step instructions on how to make your own Boo Bubble: https://www.stevespanglerscience.com/lab/experiments/boo-bubbles-dry-ice-science/. My kindergartners LOVED this activity. We talked about the properties of dry ice. Tried to catch CO2 as we exhaled – didn’t work 😉 Then compared and contrasted dry ice to water ice cubes. I had the kids use my 5th graders very clean ankle socks as gloves – so easy for kinders to get these on by themselves. Then we laughed and giggled as they got to hold and bounce the bubbles. A very easy and exciting activity that we completed in 30 minutes. A week later, the students were still talking about the CO2 bubbles they could hold. SOOOO fun! Your kids will love you for buying this. Boo Bubbles will not be in any of our Spangler Science Club kits. Who invented the bubble generator? Steve Spangler invented the Boo Bubble kit. This activity invited more students who were just passing by the classroom who wanted to see what was going on. The kids are fascinated with learning new things and regardless of how simple the idea is, these students walked away learning more about science in one day than they had in years of school. 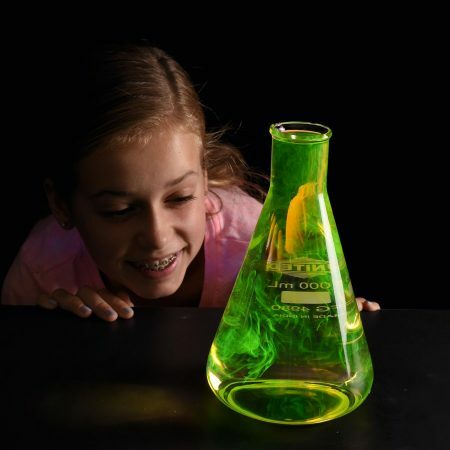 Science IS becoming fun and interesting and that is the goal; to entice learning by exploration!!! The experiment is easy to do and worked great for the first 10 to 12 bubbles then condensation collected in the tube and it didn't work after that. I had planned on using it for small groups on halloween and I am nervous if only 1 group gets to experience the bubbles. I always try it out first. I want to do it again tomorrow for a practice run again switching water and dry ice but the tube took 2 days to dry out. So not sure I will even attempt to do this experiment. Condensation in the Boo Bubbles tubing shouldn't affect the fog from coming out. Give it another try, and make sure that the water is still warm. Give us a call at (800)223-9080 if you continue to have problems. Totally recommend it, the kids had a blast for a long time with this.After making hand-held bubbles, then they tried using a tray of the soapy water and started making really big bubbles on the tray surface. This was a huge hit! The kids didn’t ever want to quit making the bubbles and trying new ways to create bigger bubbles. Everyone got into it! We used your Boo Bubbles kit and a larger version our exhibits fabricators made for our event The Science of Beer at the Adventure Science Center in Nashville, TN. We demonstrated them with both dry ice and liquid nitrogen and they were a real hit with all the adults! The event received an award of excellence for superlative achievement this week at the TN Association of Museums event. Thanks for the innovative ideas and the kits to make the activities so easy to try. Previously we’d incorporated Boo Bubbles (using liquid nitrogen we keep on-site) into a daily public program and it was also a huge hit. We’ll be using these activities again! Yes, it is so awesome and I am 27. This was just as exciting for me as my 5 year old students. The jar given is great…just dont fill up water past the tube. Add the dry ice and its soooo easy. We immediatly got bubbles filled with fog as we dipped it in the soapy water. I made the soap/water solution the day before for and let it sit. I also added glycerin. After the amazement of the bubbles wore off, we just kept adding dry ice and warm water into the jar, along with soap; put it in the sink, and made a bubble fountain. It was pretty awesome. Boo Bubbles were a hit! I made my own similar contraption out of a snapware container and tubing from our home beer brewing kit. Dry ice at our local grocery store only comes in a huge chunk, so we had plenty to "melt" all weekend! I love how this is an experiment they can safely touch – as a bonus, their hands were washed before cake and icecream!! My 4th graders loved this experiment! Too often I see 4th grade teachers skipping over science because it’s not tested! I just cringe when I hear this! Not teaching children science is doing them an injustice! With every experience that you give them you can tie it into writing or math! I used this kit with some 4-H groups that I work with. Total Hit! The kids thought it was great to be able to bounce and play with the bubbles. 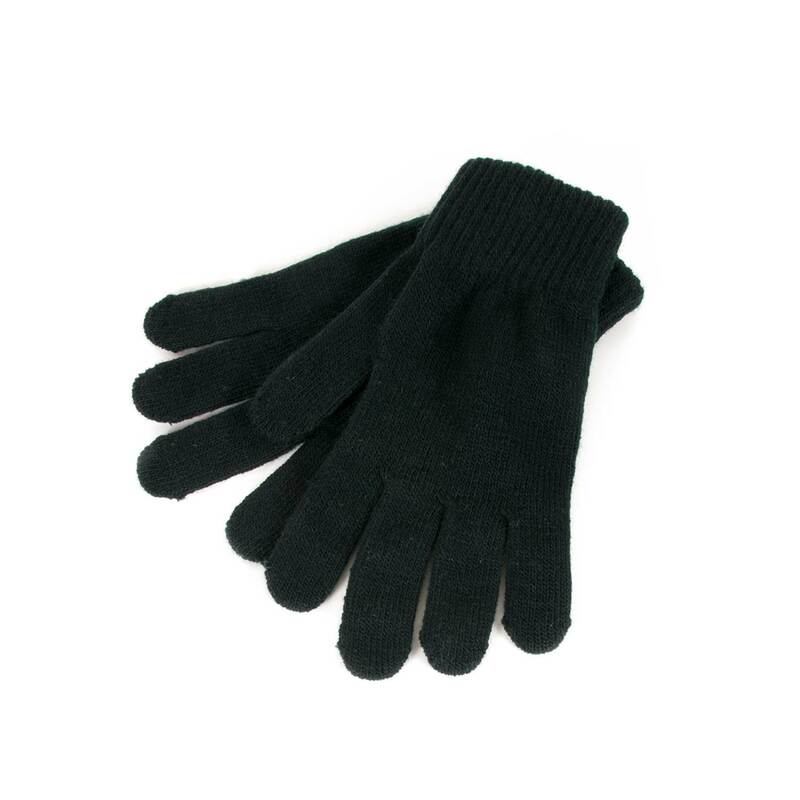 I also purchased extra knit gloves so we did not have to always change gloves. Great Idea! This was a lot of fun and easy to do. My 5 year olds loved it! Boo Bubbles are Great gift! Purchased Boo Bubbles as a gift, she loves it! When kids get excited, they get loud. Our classroom was filled with noise and excitement as the kids got to hold and burst their ghost bubbles. Incredible fun. What’s not fun about playing with dry ice. This great product keeps it safe for kids (with adult supervisions of course!). My 10 year old and friends had a blast with it. Watching the ice fog, using the attached hose, and of course, putting the bubbles everywhere possible. Good sturdy toy too! WOW - THE PARENTS AND KIDS WERE AMAZED! There were so many oohs and aaahs. Quite easy to manage too. Like all Steve’s products – wonderful quality and quantity for the price. The children found this experiment amazing! We did it last year during our annual MAD SCIENCE DAY. The only down fall is you have to have access to dry ice, but it is well worth it! This is a great product. I tried making my own using clear tubing and PVC pipe, but this works much better because the ar gives you better control of the release of the gas. Like everything Steve sells this experiment is fantastic. It is very easy working and the kids absolutely love it. It is well worth it. This is the best kit that Steve Spangler sells. I’ve never seen anything like it before, and its so much fun to make smoke bubbles. Thanks Steve! worked amazing. Easy. Kids loved it. On line videos and other dry ice demos made for a great day. Thanks. Rubber tube… pickle jar… Oh the power of simplicity. Steve should recieve the Nobel for this one… No but seriously, this device is awesome! Kept the little ones(and myself, mostly myself)enthralled or hours. SCIENCE!!! Fabulous science demo generates LOTS of interest! I used this as a science demo to drum up interest in a k-2 grade science club at our school. The directions were very clear – I had no questions. The children loved it and we were easily able to make connections to the carbon dioxide in our breath, liquid versus gas and water vapor that is seen on cold days, etc. 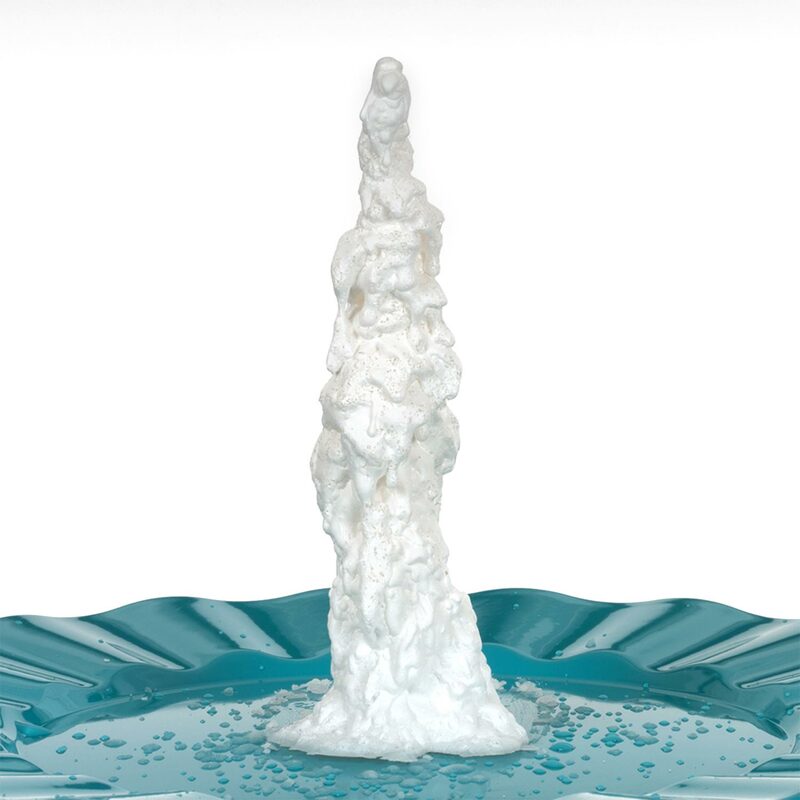 It was also very fun and easy to generate different variables to test like; tube size, nozzle type, bubble solution type, quantity of dry ice, and initial water temperature. Another fun extension is using zoom tools to make a cube shaped bubble and then making it white inside wiith the boo bubbles. My only difficulty was the 40 minute drive I had to make to find the only supplier of dry ice in all of lower Delaware. However, the dry ice was inexpensive and lasted two days in a styrofoam container. 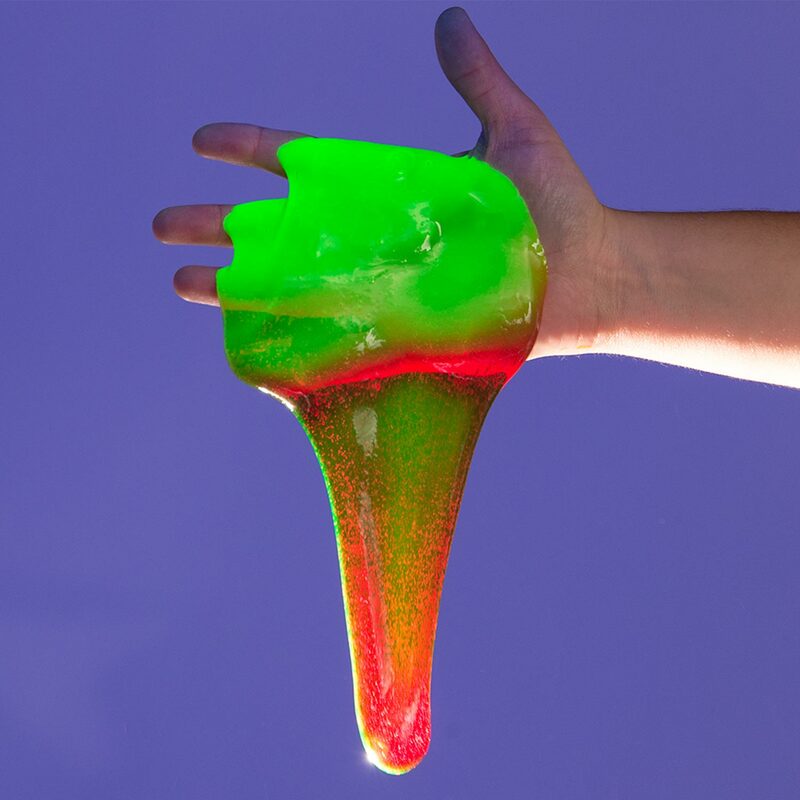 Used this for a 4th grade class party and it worked great, adults and children alike were totally fascinated by it. My son is obsessed with Boo Bubbles. He watches the video of them all the time. We got Boo Bubbles for his 5th birthday party along with insta-worms, instant snow, and slime. The Boo Bubbles were the finale and definitely the hit of the party. The kit comes with a pair of gloves but I picked up a few more from the dollar store. Luckily, all we have to do is buy dry ice from the grocery store and we can do them whenever we want! I’ve used these before (bought two several years ago) for my science club… but recently bought two more (have 40 kids this year). Once again… a huge hit. 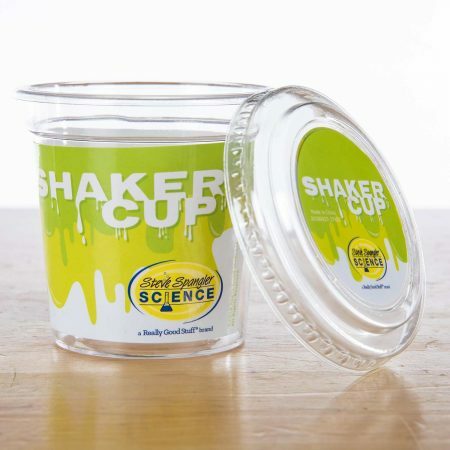 I used these last week for my science club, along with the shaker slime (another huge hit). 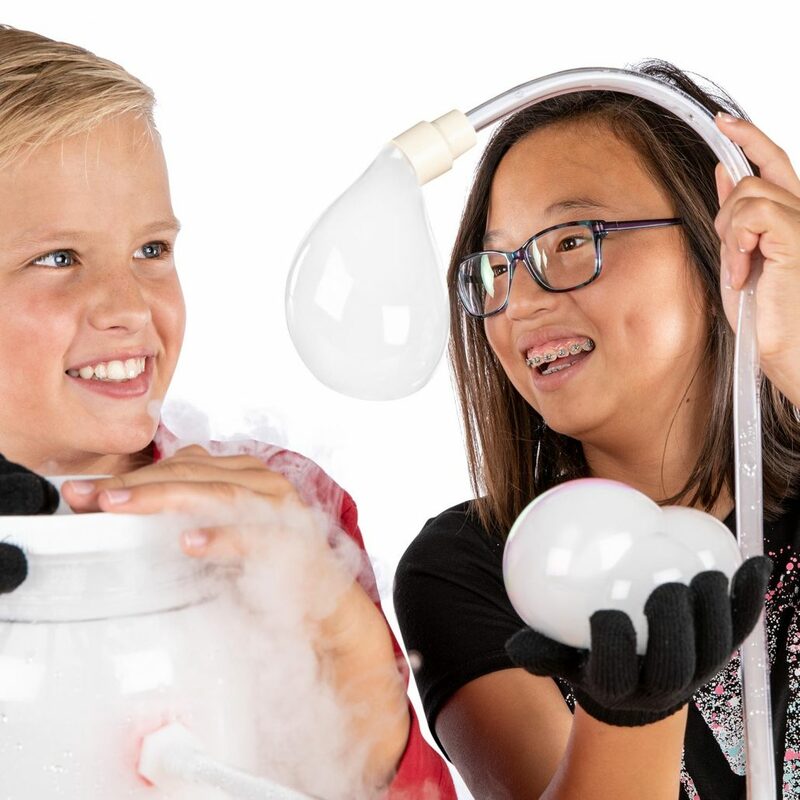 The kids love anything with dry ice (these are 3rd – 7th graders) and I had a struggle getting them to stop playing because it was time to go. Love this product! Yeh Steve! everything worked just as it was supposed to. 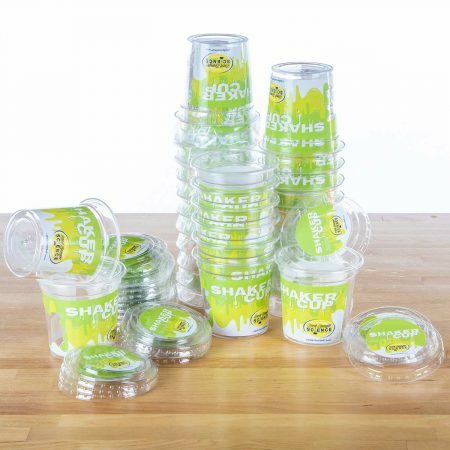 Watching the video before we did it was helpful.the little cup with soap tipped a few times so we put the soap in a larger flat bottomed container. The instructions were well done, and the accompanying book choices listed were excellent. Thanks! I bought this kit for my 7-year old son for his birthday. We followed the instructions to the tee and had perfect smoke bubbles in less than 10 minutes. Awesome!!!!!!! Simple and very engaging. Worked well with elementary and middle school aged kids, but my son (a junior in high school) spent a few hours testing it for me the night before I was to use it. Dry ice is a great substance to teach a number of concepts (density, solids/gases, and sublimation to name a few). I found cotton gloves at the Dollar Tree Store (2 pairs for, you guessed it, a buck). The kids had fun trying to pass it to one another (teamwork) and creating new dance steps while bouncing and tossing the bubbles. I’m really happy with this purchase. I would suggest putting a water fill line on the bottle so people don’t overfill. Thanks. I loooved this purchase.. BUT the bubbles that were sent opened up in the plastic bag and they got the instructions soaking wet. My recipe for bubbles is actually better than the one sent,using dawn soap works better than the joy that was in the shipment; but I love the machine; so simple, overpriced also, but I can’t make one myself. The bubbles came out slowly though and the children were very over anxious.. Just wish it could work faster, so the children would not be arguing (pre-school, 2 and 3 yr. olds)for a turn with a bubble. But, both parents and children loved the concept. The only thing I couldn’t get the hang of was making all those tiny little bubbles as shown in the video…otherwise, it’s been tons of fun and a very special THANK YOU to PRAXAIR, who donated the dry ice to my classroom! I used the Boo Bubbles as part of an October science program – Science Magic. It was the favorite station during the program. Even though we has any where from 5 to 10 kids at the station at any given time they were all able to try out the gloves and play with the bubbles. I used the glycerin in my bubble mix and it worked out well. Hi steve my father has purchased this item for my science project. It was so FUN!!! As I started testing it out I couldn’t stop. I will be making a list of what I wantfrom this site raise up money and buy it all!!! You should build walk in stores all over the country if people can’t order things. And if you do make sure to have all of the products in each store and have several stores in each city. And make a boo bubbles gun!! And a boo bubbles mat! And make a boo bubbles kit with polymers and stuff. I’m obseesed with science!!!!!!!! My son and his friends loved it. It will be great for Halloween. The product was easy to use even for a 5 year old. I see us getting a lot of use out of this. there was a line of kids wanting to play with them but it was fun. Would this set off a smoke detector in a public building? No, it will not set off the smoke detector since it’s water vapor and not smoke from an actual fire. You are good to use it in your school. The kids will love this experiment.